This course in HTML5 Game Development will teach you all about creating video games for web browsers and mobile platforms. To start the course will introduce you to the Enchant.js game engine and the Apache Cordova platform, how to create characters and maps for your game and add different systems. You will also learn how to document properly and about plans. You will learn about the different techniques used to develop characters, using Enchants and adding collisions. Next, you will be taught about creating inventory systems for player characters, along with learning about getting the player to interact with non-player characters (NPCs). This course will also teach you to create shop menu and different interaction systems for the player character. Then you will learn about using enchantments in combat scenarios for the player to fight enemy NPCs. You will learn how to add sound effects, setting up a menu system, end game screen, and adding magic to game's battle system. 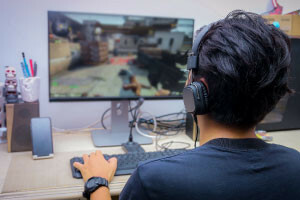 The course also looks at Azure websites and multiplayer features to connect players to the server. You will learn about further ideas to expand and develop a game. Describe how to create and setup a map for your game. Describe how to load sprites and other images into your game. Describe how to add a playable character to your game. Describe how to set collision in your game. Recognize the process of creating an inventory system in a video game. Identify how to debug using the developer tools in web browsers. Recognize the process of creating basic NPC interaction in a video game. Discuss the process of creating a shop in a video game. Describe how enchant scene stack works. Recognise the process of setting up a battle system in a video game. Identify how attacks are triggered in a video game battle system. Explain ideas for extending your video game.